Embroidered pink ribbon on white visor with adjustable strap. 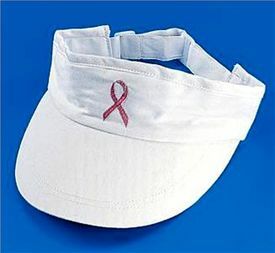 Protect yourself from those rays with this cute visor and show your support for breast cancer at the same time. 10% of the proceeds of pink products are donated to the Komen Foundation to assist in finding a cure for breast cancer.